Hal Orion is an accomplished chef and food truck owner. She loves her life, her longtime sous chef and best friend, and the food she shares with the residents of her beloved city of Buffalo. Her life is exactly how she wants it: no strings, no commitments, and no roots—just great grilled cheese and a whole lot of freedom on the side. Quinn Banning is an investment banker, and the dividend she seeks is a resurgence of the once-great city of Buffalo. Putting together her next business venture, she recognizes Hal's talent and charm as necessary assets for success—her good looks don't hurt, either. But Hal's transient ways are in direct opposition to the stability Quinn craves. Relying on their shared love of Buffalo, Quinn makes Hal an offer she can't refuse—a restaurant under her own name, complete creative control, and secure financial backing. It's every chef's dream. But Hal utters the one word Quinn can't stand to hear, "No." Will their physical attraction grow cold as they argue over their ideals, or will they find that the most distinctive ingredients often make for the perfect pairing? 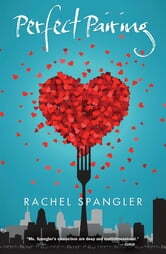 Rachel Spangler is the author of nine lesbian romance novels and novellas, and the winner of two Golden Crown Literary Awards. She pens the popular blog, Wonder Boi Writes, and lives with her wife and son in western New York.